Whalesong Cruises are Whale & Dolphin Watching Specialists, & the sheltered waters between World Heritage listed Fraser Island & the mainland, provides the best place in Australia to experience a Humpback Whale, or Dolphin close encounter like no other. We can honestly say the whales, choose to interact with the people on our boat & regularly come within meters while the Dolphins love to ride the wave made by our bulbous bow. Types of wildlife we can & have observed includes up to 4 varieties of Dolphin, Turtles, Fish & Bird Life, the shy endangered Dugong or Sea Cow & in one year we saw 5 different species of Whales. 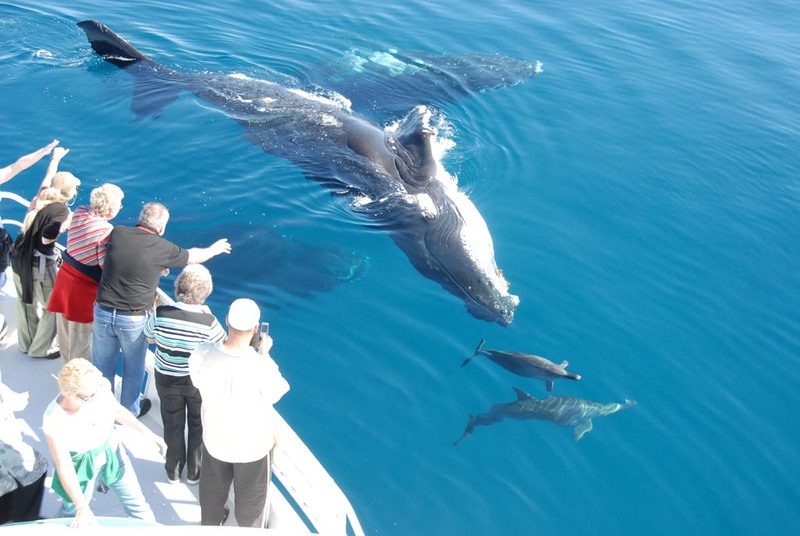 July is the beginning of our season for seeing whales in the sheltered waters of Hervey Bay. An amazing whale encounter is possible, with the teenage whales that are visiting our waterways in July being very inquisitive & playful. The whales cruise up the East Coast on the Eastern / Ocean side of Fraser Island and they actually bypass Hervey Bay on this migration North, as they are on a mission to get to their holiday destination past the Whitsunday Islands. So it is on their journey Back down the coast that the whales purposely come into the Bay & stay from 1 to 5 days. Our Whale and Dolphin Watch Cruises are a Three Quarter Day cruise with guaranteed Dolphins & the chance of seeing a whale. Our records kept for the last 15 years show that whales can be seen from the beginning of July on wards. They may arrive early in the month or later & there may be gaps in the start of their visit to the Bay, so we do not want to guarantee whale sightings too early. M.V. Whalesong, is environmentally friendly, low carbon impact & was designed to allow guests to cruise in comfort. Enclosed & open air viewing on two levels, a water level viewing area, & extra wide, walk around decks, provide the ultimate in extra viewing & seating space. So all guests have excellent vantage points for viewing a wide variety of wildlife or to just sit back & enjoy the sunset. • From 14th of July if whales are not sited, another cruise during our 2018 Whale watch season (14th July-31st October) will be offered. • Stabilizing Tanks for the smoothest ride. • Underwater listening when conditions permit. • Expert commentary & interpretation, from Passionate crew. • Local & National Award Winners. • DURATION is a minimum of 5.5 Hours. • Hervey Bay Accommodation pick up service available. • INCLUDES –guarantee of seeing dolphins; quality, substantial & fresh morning tea & Buffet Lunch; tea, herbal tea, coffee, milo & filtered water throughout cruise; all Marine Park & Department of Transport Fees. • EXCLUDES – other beverages like soft drinks, alcohol & juices; snack foods like chocolates & chips; souvenirs. Fully Licensed bar available. 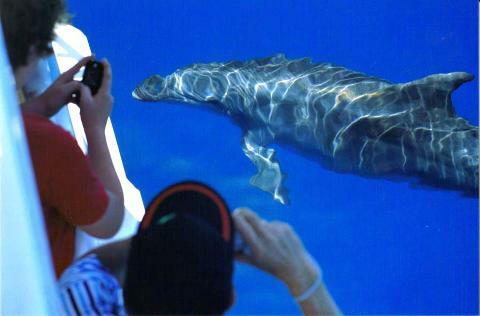 • Whalesong employs multilingual crew members.